You may have read, or seen ads recently about the benefits of spinal decompression therapy, to help pain from damaged or diseased spinal discs. This is one of the most promising new areas of therapy available to help relieve damaged discs. We are proud to provide this new hope to patients in the Lindsay area. Spinal Decompression was developed to effectively treat lower back pain and sciatica resulting from herniated or deteriorated discs. Spinal Decompression not only significantly reduces back pain in many patients, but also enables the majority of patients to return to more active lifestyles. The best of traditional chiropractic care. Our office philosophy demands that we constantly seek ways to improve how we deliver spinal health care, resulting in these effective protocols. Spinal Rejuvenation Therapy; utilizes a carefully researched, 6-step process, to re-introduce normal movement to spinal discs and segments. This results in reduction of pain-causing nerve pressure, and a restoration of nutrition and fluid flow into the spinal discs. Our goal is to restore some of the natural healing and strength to the spine and associated nervous system, which results in increased disc strength. 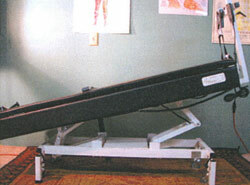 A session of Spinal Rejuvenation typically involves warm up exercises, direct muscle and spinal joint correction, nutritional and fluid balance therapy, decompression table work, and follow-up weighted exercises with customized postural body weights to train strength into spinal soft tissue that has forgotten how to function correctly. Ongoing research continues to show benefits of the comprehensive approach of spinal rejuvenation therapy for recovery of disc health. While some clinics use spinal decompression tables that have a lot of computerized technology associated with them, our tables focus on the essential components of decompression therapy, which allows us to provide the service at a more reasonable cost to the Lindsay area. If you want more information on how spinal rejuvenation therapy might help you, call us for a no-obligation consultation. We will be glad to help you find out if this is the solution you have been waiting for that gets you on the path to health again!